This is the correct Bible study to understand the real God's plan for us. When I first read his book after my apostasy from Islam, I just knew that the salvation is only through Christ. Let's partake to be the instruments of God in this crucial time of history. Get more of his work here, here, and here. 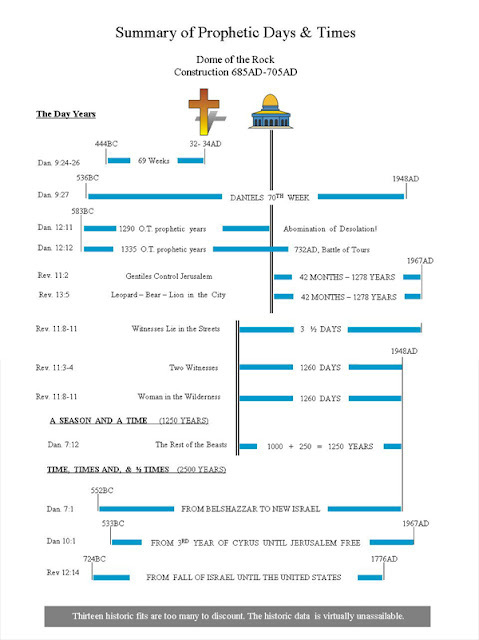 From the early Church fathers until the Reformation, the generally accepted view of Bible prophecy was “linear historic,” that Revelation was in the process of being fulfilled throughout the Christian Era. But in the 16th and 17th centuries, two new views of Bible prophecy were devised by Jesuit priests to stop the Reformers from teaching that the Catholic Church hierarchy was probably the “whore of Babylon” of Revelation 17:3-6. (Jesuit No. 1) In 1591AD, the Jesuit Ribera invented the Futurist View. He claimed that Revelation would not be fulfilled until the very end of the Christian Era. Ribera taught a rebuilt Babylon, a rebuilt temple in Jerusalem and an end-time Antichrist, etc., etc. Sound familiar? It should, Ribera is the father of the prophetic views taught by such notables as Tim LaHaye, Hal Lindsey, Jack Van Impe and Benny Hinn. (Jesuit No. 2) The Reformers didn’t buy Ribera’s attempt at creative theology so in 1614AD, the Jesuit Alcazar came up with an even more dubious view. He claimed that the book of Revelation was fulfilled by 70AD with the fall of Jerusalem. Preterism, as the view is now called, endorses Replacement Theology: a belief that God is totally finished with the physical descendants of Abraham and that the Church is the true Israel of the Christian Era. A cerebral doctrine, perhaps, but the new nation of Israel in the Holy Land makes the view untenable. Obviously, those early Jesuits had a doctrinal axe to grind and the Reformers knew it, so one wonders why so many Protestant churches now endorse 400 year old Jesuit doctrines that don’t fit today’s realities. For example, during the 80's, the Cold War was just inches from running hot and the Church’s prophetic leaders were trumpeting -- in unison -- that the USSR was the final enemy of the Church. Supposedly, the Seven Year Great Tribulation was just about to begin, and Antichrist? Oh, he was lurking out there too, just itching to take over the world. As their story went, Antichrist had to be the Pope or maybe one of those godless leaders from the USSR. Well guess what, those prophetic hobnobs soon discovered they were wrong, but they clung to their faulty doctrines anyway, and still do. Skolfield is the only Bible teacher we know of, who, because of Bible prophecy, had the Islamic World on his radar screen in the late 70's. Well, Skolfield never did see, and nothing they said was going to happen ever happened. Instead, we see Israel and the rest of the Middle East now centered on the world’s stage just as the Bible predicted. 9/11 was our wake-up call from hell and we can now see the final enemy of the Church and Israel: It’s Islam and the murderous terrorists that religion supports! Many are beginning to see our coming conflict with the Islamic world, but Skolfield has been warning us about it for over 25 years. Even today, some claim his prophetic conclusions were ridiculous even though everything he wrote about came true. About Preterism, little more need be said. The existence of the new nation of Israel is that false doctrine’s death-knell. Some still defend the view despite the irrefutable evidence of their own eyes: A new nation of Israel chock full of Jews is in the Holy Land right now, no waiting. The star of David flies over the battlements of Jerusalem once again, just like the Bible said it would.